Truck accidents can be devastating, and frequently cause catastrophic and even fatal injuries simply due to the size and velocity of a truck on the roadway. 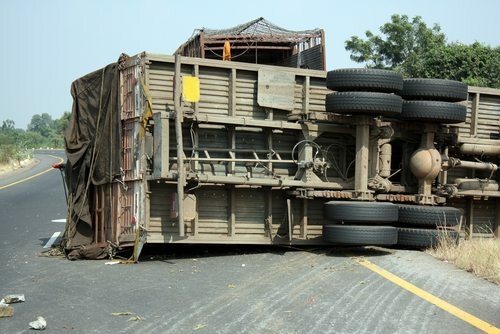 There are many causes of a truck accident, many of which involve negligence or carelessness of some kind. Here are several common causes of truck accidents and what you can do if you or a loved one were the victim of such an accident. Over the road truck drivers are often required to drive long hours with few stops in between in order to arrive at their destination at a certain time. This can cause fatigue, and can reduce the driver’s ability to drive safely, or respond quickly to changes in driving conditions. Many truck accidents are caused by a driver falling asleep at the wheel, or not reacting fast enough when they are extremely tired. Truck drivers use a variety of electronics to help them during their job. From smartphones to keep in contact with friends and family, to GPS systems and in-truck communication devices, a driver can become quite distracted by electronic devices while operating his or her vehicle. While drivers cannot use cell phones, tablets or similar electronics while driving, many still do instead of waiting until they are stopped. Being distracted by electronics can cause a driver to lose control of the truck, causing serious accidents. A trucking company’s failure to properly train their employees or only allow competent employees behind the wheel of a truck can also be a common reason for a truck accident. Often due to employee shortages or increased demand, a company will become less stringent on their requirements for drivers, putting inexperienced drivers on the road in large, dangerous trucks. Inexperienced drivers may not know how to properly operate their vehicle, or how to respond to certain situations in such a large vehicle. If you or someone you love are involved in a truck accident, it is important that you take action as soon as possible. You may be eligible for compensation for your medical expenses, lost wages, and pain and suffering related to the accident. A skilled Florida truck accident lawyer can help you recover the maximum amount of financial restitution available in your case and assist you in recovering from the trauma of a devastating truck accident. The Slonaker Law Firm is well-versed in Ocala personal injury laws, and can apply his skills and expertise to your case. He knows how horrific truck accidents can be for the victims and their families, and is dedicated to providing comprehensive and compassionate legal services to those who were involved in such a frightening and upsetting situation. Contact the Slonaker Law Firm today for a consultation by calling 352-629-6656 or toll free at 888-629-6656. Our attorneys are standing by now to assist you and your loved ones after a truck accident.